Numbers play a very important part in our daily life due to their many pragmatic uses. Just think of how often we count or measure things, and perform all sorts of mathematical operations! It’s not surprising that the Aztecs, who lived in a highly organized society just like we do, also made constant use of numbers to carry out different practical tasks: they measured time, quantified things to be sold, kept track of the days and so on. However, rather unlike us, the Aztecs drew heavily on the esoteric nature of numbers. Throughout the ages, the very nature of numbers has posed a lot of puzzling questions to humans. Numbers are often thought of as “ideal” entities because there’s no such a thing in nature as a number in itself. There are things (concrete or not) that can be counted, but there’s no such thing as a “Three”. Have you ever seen one? I guess not. Neither have I. Now, we certainly have graphical depictions to represent these things we call numbers, whatever these things might be. Such representations are called numerals, but they are nothing more than cultural conventions. That is why we can use different symbols to represent numbers. E.g.. number three, in the Arabic tradition we put like this “3”, while in the Roman, we simply draw three lines like this “III”, and both are correct. However, if you had lived in the Aztec empire things would have been very different. The Aztecs had a very different way of seeing the world, and numbers to them had a very deep magical dimension. This was especially true in relation to their Tonalpohualli, or divinatory calendar. 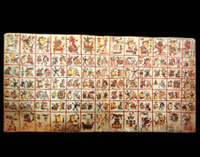 This calendar, which was literally a “count of the days”, ran parallel alongside another “official” calendar, called the Xiuhpohualli, which served to mark the civic festivities, but, unlike the latter, the Tonalpohualli had a very peculiar divinatory quality: its different combinations revealed the character traits and most probable fate which would befall each and every person. Therefore, knowing the particular day sign on which one was born, and its protective deities, was crucial to any Aztec individual. The Tonalpohualli consisted of a series of 13 numbers (probably based on the 13 levels of heaven as conceived by the Aztec mythology) which were combined with a series of 20 day signs (Death, Wind, Rain, etc.). When put together, these numbers and signs provided a very special unit called a day-sign. Since there are only 260 possible combinations (13 days x 20 signs) the calendar was 260 days long. And each one of these days – or combinations- possessed a very precise nature which could be lucky or unlucky. Day-signs also determined the suitability of any given date for carrying out important matters. 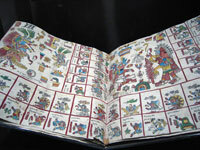 So consulting this calendar was a crucial matter to the Aztec people. Of course, this wasn’t the kind of knowledge possessed just by anyone. Only specialized priests could understand and interpret this complex body of knowledge. 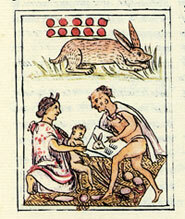 We can appreciate how in being part of the divinatory calendar, numbers where in direct contact with the world of the supernatural, that which lies hidden far away from the realm of mere human experience, and, in consequence, belonged to a very special category of elements of the Aztec world. On the other hand, besides this powerful and complex esoteric dimension, the Aztecs also used numbers to contain other kinds of ideas; ideas quite different from mathematical ones. I find this phenomenon to be very interesting because, through the understanding of the symbolic use of numbers, we get a great opportunity to get in touch with some profound aspects of the Aztecs’ worldview. Think, for example, of what I previously mentioned about floors and seats with the number 13? We consider that unlucky, don’t we? Or, as another example, how do you feel about number 666 (the number of the devil in the Christian tradition)? Well, this can tell a lot about who we are and what we believe in, right? This gives us a very attractive way to learn a bit more about the Aztecs and their understanding of existence. This number represented water. Probably in association with the ideas of fertility and the principle of duality – it takes two to bring life about - underlying all existing things. The Indians associated the number three with cosmic fire and sacred war. 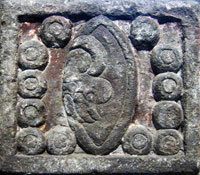 Notice that Aztec hearths always contained three stones. These two numbers put together conveyed the idea of war. How? 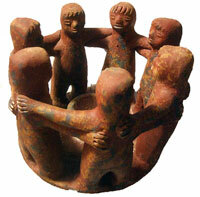 Well, two stood for water and three for fire, and that is exactly what the Aztecs called war: ‘burning-water’. A number related to stability and the directions of the universe. Four was balance. Five is a number that recalls instability. It is a number or rupture and overcoming: because it is the central point it alters the stability of the other four world directions (south, north, east, west). There was an important underlying ethnic meaning to this number, because in Aztec mythology there had been seven original Chichimec tribes in the legendary place of Chicomoztoc (or Place of the Seven Caves). Seven is also an earth-bound number. There is a strong sense of association with the divine character of earth through the existence of female earth goddesses like Chicomecóatl (Seven-Serpent) and Chicomexóchitl (Seven-Flower), protector of farmers. An unlucky number commonly associated with the night, with death, with the interior of the earth and with [the levels of] the underworld. Archaeologist Eduardo Matos Moctezuma thinks that this is directly related to the mystery of the human female nine month period of gestation (growing-in-the-womb). It may also relate to the 9 orifices (openings) in the human body. This is the cipher or number that represents daytime and the sky because in Aztec mythology there were thirteen heavens. All ancient Mesoamerican peoples counted in twenties - presumably because we have twenty fingers and toes. The very word for ‘twenty’ in the Aztec language, cempohualli, means ‘one count’. There are still some Maya villages today where a person is called ‘a twenty’...! To us this numeral might just look like four times one hundred. However, when the Aztecs used this number they actually meant “many”. What a curious figure of speech, isn’t it? I hope you’ve found these reflections on numbers and the Aztec world as intriguing and amazing as I have! Great article! The number 4 is also an important number for many North American tribes too. Ironically, 4 is the unlucky number in China and Japan because it is pronounced in a similar way to the word for “death”. You’re completely right calendar-wise, but he rather related it to the nine times the pregnant woman’s period is lost. The only problem that saw would be the explanation of 9. The concept of 9 months for pregnancy is based on the calendar we use today.